As a continued effort to deliver the latest enhancements and improvements of our products, we have officially release our Product Update #1 to 2017 providing valuable improvements to the quality and usability of the application along with many performance improvements. Access to the installation is available in the IronCAD Live Update that is installed with the IronCAD 2017 DCS. If enabled, you will receive a notification of the new version and will be able to download and install from this utility. You can manually download the installation from the links below following the provided installation notes. This installation can only install on the IronCAD Design Collaboration Suite 2017 and 2017 Service Pack #1 and will update all products included with the Design Collaboration Suite (IRONCAD, INOVATE, IRONCAD DRAFT, and IRONCAD COMPOSE). This Service Patch cannot be uninstalled individually from the Add/Remove Programs in the control panel. To uninstall, you will need to remove the full IronCAD 2017 Product Update #1 version and reinstall the standard 2017. Graphical Performance Improvements – Graphical interactions such as pan, zoom, and rotate in the 3D environment have been improved even further from 2017. Increases in performance have reached 45% better in average across large assemblies. Save Performance Improvements – Additional improvement from 2017 in saving have improved the save times by 25% on large assembly data sets. Upgrade to Latest Native Translators – The latest release of the IronCAD Native Translators support all the industries latest formats including Catia R2016, Inventor 2017, NX 11, Solid Edge ST9, and SolidWorks 2017. Upgrade to Latest Modeling Kernels – IronCAD has updated both ACIS and Parasolid to improve quality and resolve quality reports related to the modeling kernels. User Interface Style Update – IronCAD 2017 Product Update #1 has been updated to support the latest 2016 Microsoft UI styles. The default has been set to the 2016 Blue style however you can change to any previous supported style under the style settings in the top right of the application window. 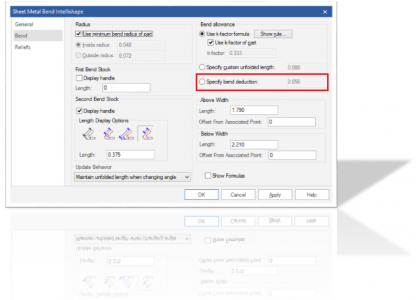 Bend Deduction Setting – Users can choose bend allowance and bend deduction calculations to determine the flat length of sheet stock required to deliver the desired dimension of the bent part. Product Update 1 has added support for Bend Deduction on the individual bend settings to allow users additional control of their unfolds. Materials Library & Smart Paints – A new materials library has been added that lets users set parts with various material information and color properties for visual appearance. Gear Tool – A new command browser for create Gears has been added. This tool has similar properties found in the Tools Catalog for gears but now is based in a browser UI that has editable text files to add/remove information. Plane Surface Tool – A new surface tool has been added to create a plane surface. Simply define a plane orientation, location, and size an the plane will be generated. Quick Select Smart Dimensioning – The IronCAD Drawing has added support of a new dimension behavior that allows for the direct selection of lines to dimension in between. Previously, users would need to hold down the Shift key to support this behavior but now it has been made a default action (e.g., If one selects a line, one gets the dimension of the line. Click to place or pick another line to change the dimension to be the distance between the two selected lines or angle). 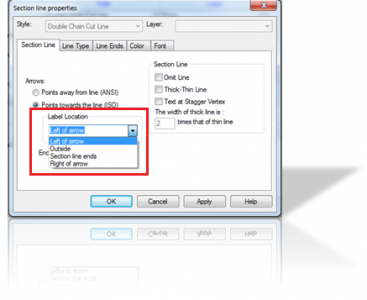 Section Line Label Locations – Users now have setting in the Section Line Styles to define a location for the Label created for Section Lines. Improvements in Section View Labeling – Improvements have been made to make it easier to reset the section view label. 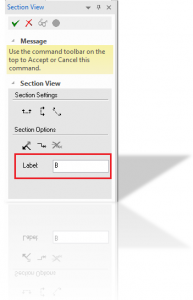 In the section command browser, the label setting has been added to allow quick editing versus changing in the properties after the section has been created. Assign Line Types to View Styles – Line Types set in the View Properties of the Default Styles now properly allows individual Line Type settings to be stored per style. Custom Holes in Hole Table Quantity Count – The Hole Table has been improved to properly identify custom holes and to generate the correct hole quantity. Previous versions only support simple Custom Hole types. IronCAD DRAFT Hole Table Item Naming – New in the Auto Hole Table List in the DRAFT environment is the ability to set a name for the Hole Origin to identify specific hole lists. For example: H1 and H2 lists where a group of holes can be identified as H1 and another set of holes (at the same or different origin location) can be labeled H2. IronCAD DRAFT Ordinate Dimension Identification – When selecting Ordinate (Coordinate) dimensions, the origin dimension will highlight to identify the origin set. This is useful when more than one ordinate dimension set is added to a drawing view. IronCAD DRAFT Standard Manager – A common location to edit and manage standards has been added in DRAFT. Within this tool, you can see the current set standards, edit existing standards, and define default standards. 107129 54612 ICD Broken View Creation creates a blank view. 107138 54628 Steel Frame Custom Property “FrameLength” won’t show in the BOM. 107720 56762 IAE: IronCAD Crashes when you edit the Diameter of the holes in the part. 107740 56787 Can’t dimension the 2D Sketch projected in this drawing. 107744 56844 Views don’t update in CAXA Draft. 107768 56926 Can’t select or delete the hole table in this drawing. 107774 56930 World Axis symbol doubles when 2D Shape is selected. 107813 56962 ICS file doesn’t load into 2017 after saving and closing 2017, it loads in 2016. 107831 57065 When turning off Radius, bend callout goes to two lines even though it’s set to single line. 107927 57257 IronWEB html contains path for the viewer to www.hoop3d.com and crashes IE 11. 107949 57290 Structured Steel part’s part number and description not appearing in the BOM. 108066 57794 IAE when updating all views in this drawing. 108207 58190 Regression – Crash when copying a cone shape. 108235 58342 Can’t save this EXB to a DWG. 108309 58599 Other user in use as read only notification not working in this case. 108323 58627 Incorrect unfold results. 56863 Unlink part, one of the parts disappears. 56884 Unlink the part, the number of bodies will be lost. 56887 When switch fillet surface style, all selected references should clear automatically. 56889 The number of bodies is wrong. 56988 Edit fastener, there is a redundant option. 57004 Edit the washer, the part is broken. 57069 Chamfer edges, two distance type, the start distance value of one edge is not the one you set. 57106 Regression: The shape analysis is wrong. 57113 Edit bridge curve, but it doesn’t show in the scene. 57116 Link the sketch, but I can’t break the link. 57135 Create link part/assembly, and change them name, the linked part/assembly name no longer change automatically. 57213 Section Line Labels are in the wrong position in exported DWG. 57269 Read me link doesn’t work on the Polish Setup Wizard. 57286 Polish 32-bit 2017 – Wrong working folder. 57325 Link part, then edit the feature, undo, Pop up IAE. 57331 Add chamfer edge on the washer, then suppress the washer, the chamfer edge is lost. 57332 Link the part, the original part doesn’t show in the scene. 57376 Create variable fillet, The accuracy is different from 2016. 57415 Create variable fillet, undo, crash. 57451 Features fail in 2017 when regen’ing this part. 57493 Can’t move text that has been pasted to a new drawing then associated to a new view. 57509 Can’t edit the dimension value by right menu. 57510 Draw a new wire to create extrude part, undo, Crash. 57527 Draw two lines, their angle is not equal to 90 degrees tangent .tangent constrain is displayed. 57573 Edit chamfer, the edge can’t highlight. 57579 Drag the handle, the values direction should be match with the extruding direction. 57580 Extrude the surface, the neutral surface’s position is wrong. 57582 Draw 3D wire to create sweep feature, the 3D wire is broken. 57672 Draw ellipse, lock the dimension, it will create a redundant ellipse. 57674 Draw ellipse, unlock the dimension, edit the value, can’t drive the dimension. 57687 IAE when adding a new sheet in ICD. 57699 The offset dimension doesn’t show in the scene. 57725 Diameter symbol is messed up in User Defined Symbols. 57732 Open an old file, it is difficult to select the body in scene browser. 57844 The default BOM style in the ANSI templates is not good. Wrong sizing. 57849 Arrow sizes don’t match. 57912 Regression – Can’t get Meta data from imported Inventor file when Parasolid is the default kernel. 57959 HSF is not being created for PackageBuilder and IronWEB. 57963 Live Update keeps wanting to update TRANS PU1 even after it’s installed. 58497 Edit, Save and Close this Externally linked assembly and IronCAD closes. 58560 ACIS and Parasolid present different unfold results on this sheet metal loft part, I suspect ACIS is wrong. 58776 Part property string isn’t updated correctly when the driving parameter value is changed.